Nigerian airline, Arik Air has explained why one of its airplane travelling from Lagos to Accra, Ghana, made an emergency landing on Tuesday. The aircraft made the emergency landing after the pilot detected a smoke coming from its cabin. 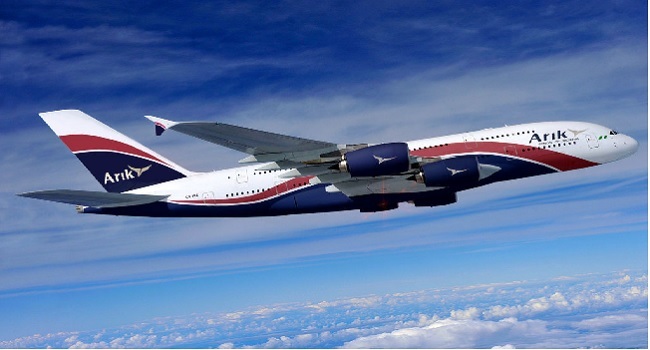 The Airline in a statement signed by its spokesperson, Adebanji Ola, on Thursday explained why the emergency landing was declared noting that the Captain duly briefed the passengers when the incident occurred. “Arik Air flight W3 304 from Lagos to Accra on March 6, 2018, declared an emergency in line with standard operating procedures when an unknown source of the smoke was detected in the cabin 81 miles from Accra. “The captain of the flight briefed the passengers accordingly assuring them that the aircraft was under control and safe for landing in Accra. The spokesperson said further in the statement that a team of engineers are currently conducting inspections on the aircraft which is now parked in Accra, Ghana. “The aircraft is currently parked in Acrra and our team of engineers are conducting comprehensive inspections on the aircraft to ascertain the cause of the smoke, after which the aircraft will be flown without passengers to a maintenance facility for rectification and testing. “The relevant aviation authorities in Ghana and Nigeria have been briefed appropriately on the incident,” he said. A passenger of the airplane had earlier on Thursday taken to the social media to complain over the alleged ill-treatment of the passengers on the flight when the ‘smoking’ plane eventually landed in Ghana, an experience which he said left many in shock. The Nigerian government on Wednesday summoned the Minister of State Aviation, Hadi Sirika in reaction to the Dana Air accident and also ordered a complete audit of the airline’s operations. The Senate asked the Minister to appear before lawmakers at Plenary and explain the reason for the recent air mishaps and near fatalities in the country.